in the Bahamas is the "raken'n'scrape", which is played in bars and festivals. This music is played accordion and guitars. The Bahamians are generally affable and friendly. They love to have fun, as evidenced by the Junkanoo Festival, held between December 26 (Boxing Day) and January 1 in the main cities of the archipelago. Not to be missed under any circumstances. The Junkanoo, an explosion of colors, music and joy comparable to Carnival in Rio and New Orleans, brings together the different roots of the Bahamian culture: African, Caribbean and English. In Nassau, you can visit a museum dedicated to the Junkanoo masks and customs. You can also see the facilities where they are manufactured using traditional methods throughout the year.If the Bahamas visited during the summer, you can attend the Goombay in Nassau: A miniature Junkanoo is celebrated every Wednesday on Bay Street. Playa pink sand beach:The beautiful beach Pink Sand Beach owes its name to the pink sands that the amount of red coral in the area and the white sand gives a pink color. Best times to take photographs in the early morning or at dusk. You reach this beach by air or by water taxis from North Eleuthera. 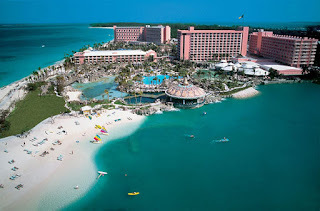 Paradise Island:In Paradise Island, Nassau, in the Hotel Atlantis there is a huge aquarium where playing the lost city of Atlantis and has a glass tunnel through which roam sharks, sawfish and other predators. eleuthera Icelandic:Eleuthera Island is 96 kilometers of Nassau, has a sickle with a mountain like a hump, is 177 kilometers. It is an island of coral and sand formed by the action of winds and waves. This island enchants tourists for its white and pink sands, pineapple plantations and colonial villas. Grand Bahamas:A few kilometers from Nassau is the Grand Bahamas Island, 90 kilometers from the coast of Florida, United States. Its capital is Freeport, which has many hotels, golf courses and a large shopping area, with its tranquil parks that are considered the best of the islands. Sandy beaches and crystal clear waters is what attracts tourists.